Although not as pronounced as when it happens in autumn, there are a couple of weeks in spring when the sun is at a low angle in the sky and it fills the garden with a wonderful soft yellow light. We have several plants that also have golden foliage or flowers and these look particularly good around this time of year. 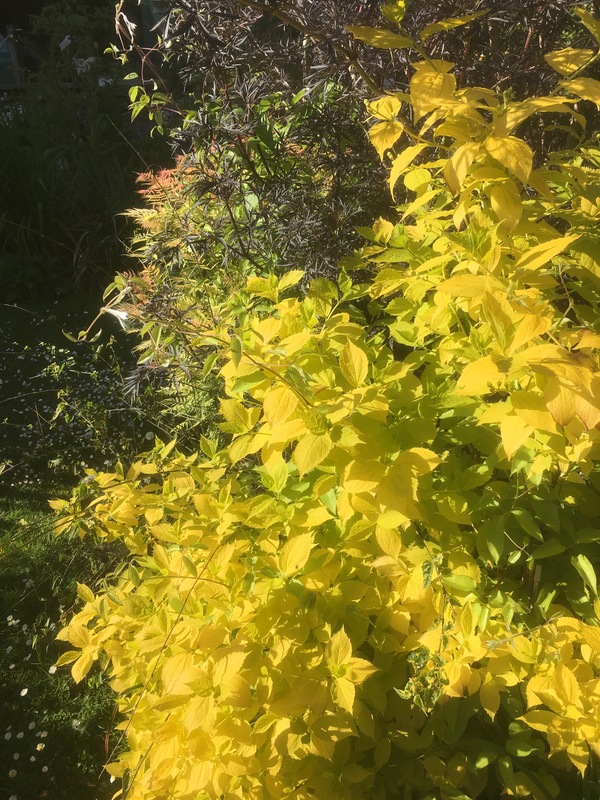 The Philadelphus Coronarious “Aureus” is especially stunning, the foliage gleams a bright gold, which is offset even more by the dark Sambucus Nigra growing behind it. 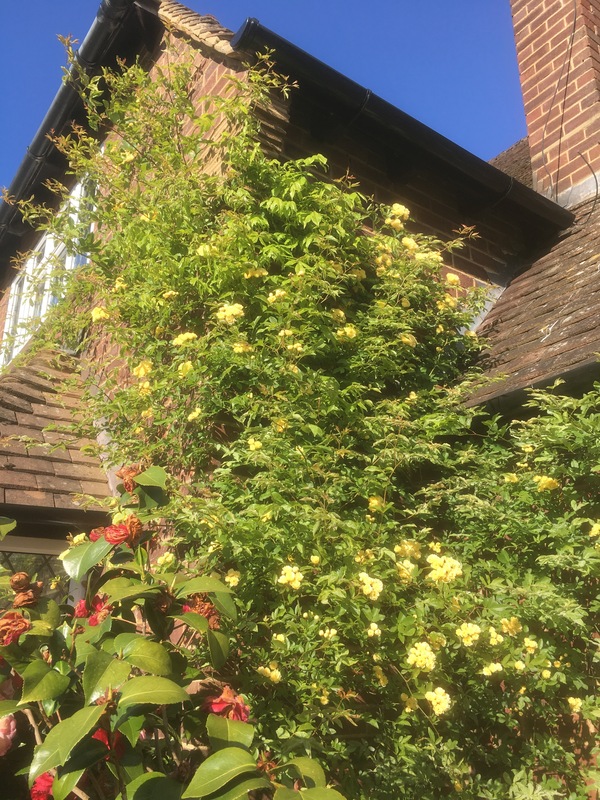 At the front of the house is a Rosa Banksiae Lutea, which has flowered this year. It’s not a jaw-dropping display yet, but it is a very young plant and has already reached halfway along the house in a couple of years. It it one of the few plants that can compete with Wisteria and it’s currently winning. The dainty clusters of lemon-yellow flowers look like the climber is set with festoons of lights. I am very, very thankful that this rose is completely thornless as I get the sense that it has no sense of personal or domestic boundaries. This year the two rose arches that we brought with us from the old garden will finally reach the same level as they were at before we had to uproot them and the roses planted against them. The roses aren’t quite “kissing at the top”, but they’re likely to by late season. I like the view through the arches as there is the “wall” of fruit from Fruit Avenue to the right and there is no sense of the formal delphinium crescent that is on the left. 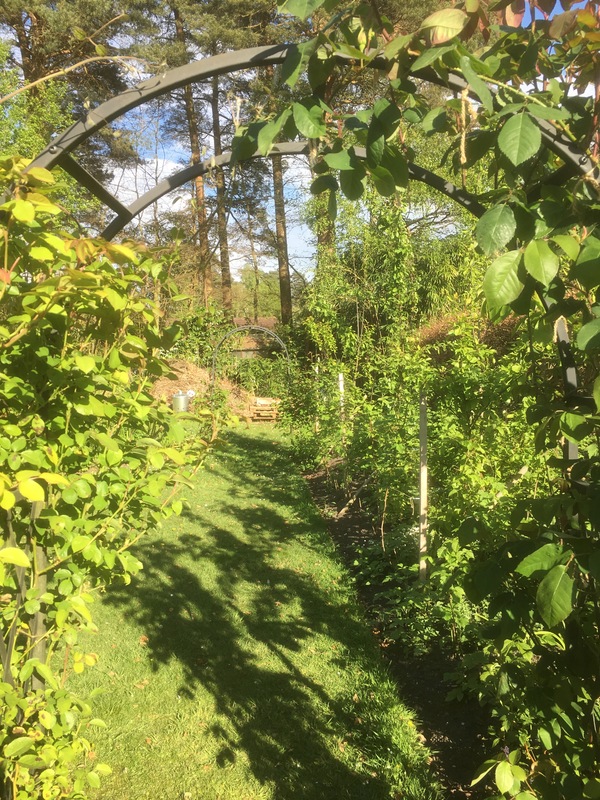 I will have to think about what to put beyond the second arch as a point of interest draw the wanderer forward and distract them from picking the raspberries from the fruiting canes. Just beautiful! I love that golden glow. 🙂 I’ve grown Lady Banks rose, too, and it’s hard to argue with a free flowering, thornless rose. I’m very glad it’s thornless as as the rate it’s growing, I’m going to need to keep it from clambering over not just our roof, but the neighbour’s too! Love the Banksia lutea, what a stunner. My goodness, Jason, my blog software thought your comments were spam, how rude, I’ve no idea why! Anyway, thank you, I’m not sure just how large and vigorous it’s going to get so I’m excited but also slightly worried about it. Thanks, Jayne. Most of the roses are beginning to flower, now that it is coming into June and we have some sunshine. I’ll have to try and capture them in bloom.